I have one more Christmas card to share with you tonight. I created this card using a freebie from Word Art Wednesday. I started with a sage green card base. 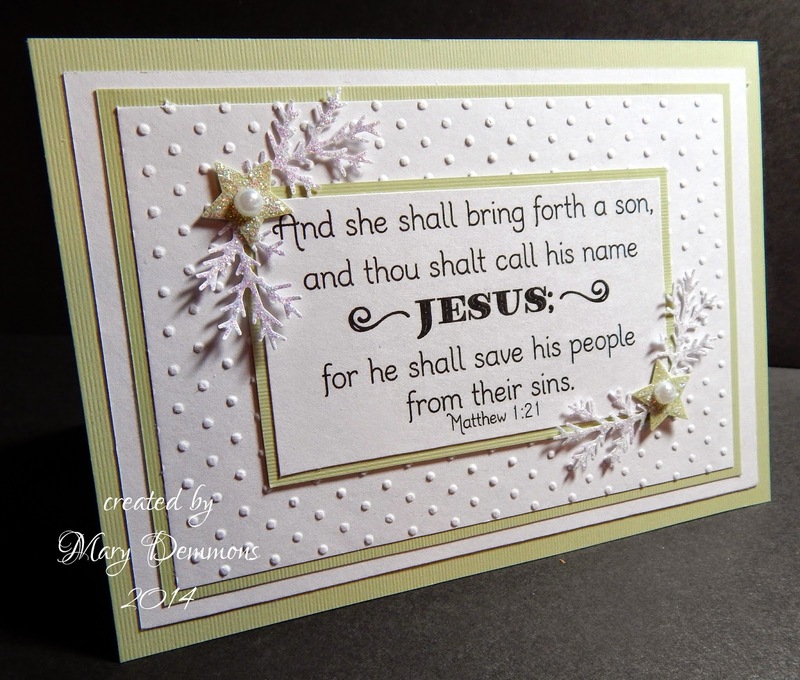 I embossed a piece of white card stock using my Sizzix and a dot embossing folder and backed it in sage green card stock and then again in white card stock. I added this to the card base. I printed the freebie out on white card stock and backed it in sage green card stock then added it to the center of the card. From white card stock I punched branches using a Martha Stewart branch punch and from sage green card stock I punched stars using a star punch from EK Success. I layered 2 branches and 1 star in the upper left corner and lower right corner of the sentiment. I added a pearl to the center of each star and added crystal stickles to the stars and branches. Gorgeous card. Love the scripture. Thanks for playing along with us at Frosted Designs. Lovely card. You have been busy. Thanks for joining us at Frosted Designs. I love the simplicity of this one - another pretty card!!! Thanks for joining us at Frosted Designs!! Beautiful!!! Thanks for playing along with Frosted Designs!!! Thanks for joining us at Frosted Designs.